Daniela Jordan-Villaveces is one of the many New York-based emerging designers doing away with the idea that the modern city dweller can't (or won't!) wear color. Her ethical fashion brand Apalma seeks to empower its wearers through bold color palettes and prints — both core visual attributes that have made the brand both instantly recognizable and a favorite within our community. After getting a preview of Apalma's SS19 offering here in New York at our trade show, we found ourselves making a plan to peer behind the curtain and see the designer in action at her studio in Brooklyn. 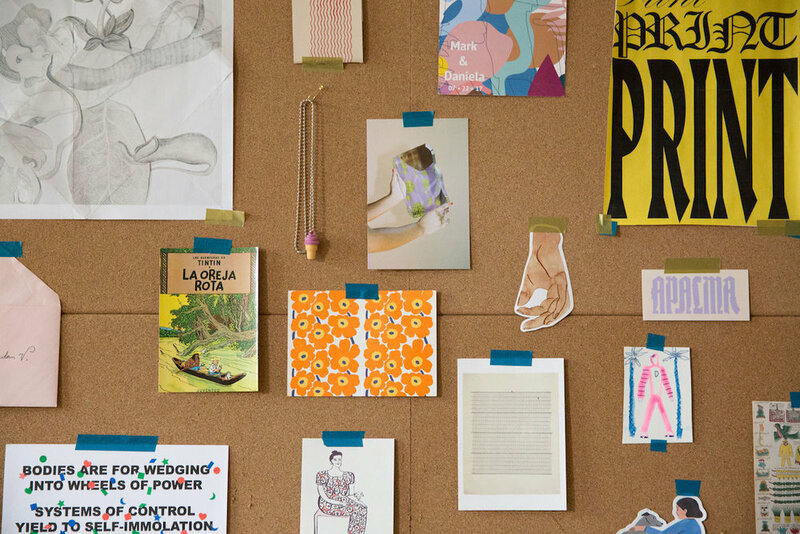 You'll see more of the space below, but we'll preface our interview by saying that Daniela's studio genuinely embodies all of the things we love about her work with its colorful yet cozy ambiance. After getting a firsthand look into her process, Daniela sat down with us to discuss her journey in fashion and her relationship to design as both a print designer and illustrator. She also talked openly about her commitment to running an ethical brand along with the importance of fostering a community of like-minded creatives. Hi Daniela. Please introduce yourself! Hi! My name is Daniela Jordan-Villaveces, I’m a print designer and illustrator. In 2016 I founded Apalma to make unique clothes that were sustainably-made. I was born and raised in Bogotá, Colombia and after stints in Florida and Toronto, Canada I moved to NYC in 2012. Describe your relationship to both design and fashion. How have you been able to marry your talents as an illustrator and designer to create the Apalma brand? I’ve always wanted to create prints. In art school, I was a printmaking major, and even then my “fine art” work was always pattern-driven. I have dreams of exploring patterns and creating over-the-top colorful environments. Making clothes for other people to enjoy seems like one of the most rewarding ways of creating this imagined universe. Talk to us more about the inception of Apalma and what void you wanted to fill within the market. How would you say the brand has evolved since first starting? After working for a print studio and as a designer for children’s brands, I wanted to create unique prints and clothing that didn’t have to follow any trends. Apalma is refined and marketable but what dictates our aesthetic is a need to explore rather than a marketing ploy. 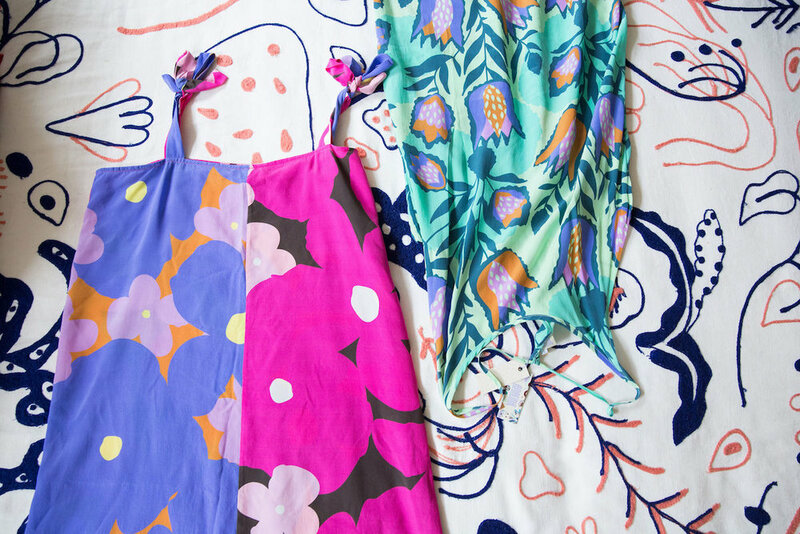 It seems that the brand is best known for its bold prints. Why does this design element speak to you and how would you describe your process? I can't imagine doing anything else in my life other than illustrating prints! It's the raison d'être of the brand. I have loose ideas about silhouettes and cuts when I start designing, but before anything else gets done, I make the prints. While I appreciate a good monochrome or even a beautiful neutral, it's hard for me to “tone it down” when it comes to color. As I sketch ideas for the prints, I create a color palette that I always try to stick to. Once the prints are done, it's so fun to think about what garments they would look best on. And just like that, a collection comes to life. I think wearing prints makes people feel good and in a celebratory mood. It draws others in and makes you approachable. You don't need to look like a clown to look happy, but humans do react positively to colors and bold shapes so if I can make someone feel energized when they wear Apalma, my day is made. Apalma is also known for championing ethical design and supporting fellow makers. In a world where sustainability and ethics can often be synonymous with marketing buzzwords, how would you define "ethical" design and what characteristics contribute to something that is truly ethically-made? Working for big companies as a designer, I would submit my work never knowing who was manufacturing it. The answer was always China, but nothing else was explained. Having a small clothing line, I can control production and work with businesses in which work environments are more than adequate and fair pay is the standard. In Colombia, our team is guaranteed healthcare and a retirement plan fund. Aside from the creative responsibilities what are some of your other tasks? Even though I do 95% of the work that goes into Apalma, my husband Mark has been a huge help since the brand’s inception. He’s helped with the everyday logistics of running a business but also with silly tasks — no job is too small. My family in Colombia also helps out whenever they can. Since I had only worked as a designer, there were a lot of business-related things I never had to deal with, so I’ve had to learn as I go and there is a lot I still need to figure out. Slow and steady! How would you say being part of the Brand Assembly community has contributed to the growth of Apalma and why is it important to connect with fellow emerging designers? The team at Brand Assembly is so helpful and kind, and the designer community is lovely. Connecting with other designers or people in the industry always gives me a boost of confidence. This business is very demanding and knowing other people are going through similar growing pains feels reassuring. It's so nice to share tips and tricks and have people explain their design process. I love learning and sharing (and chatting, haha!). What advice do you have for fellow designers looking to build contemporary brands with a conscious mission? Don’t give up! It’s not going to be easy, and sometimes it won’t be fun, but even the smallest of accomplishments feel like the biggest rewards when you work on something you believe in. Follow your instincts and know you’ll have to work very hard.